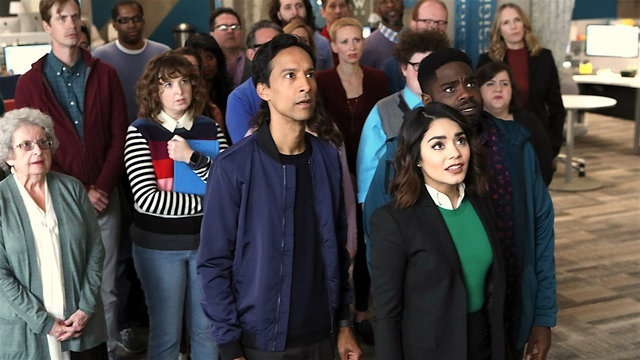 Doux Reviews: Discussion: Did You Watch Powerless? NBC's new superhero-adjacent DC universe sitcom premiered on Thursday. Powerless stars Danny Pudi (Abed from Community), Alan Tudyk (do we know who he is? ), and Vanessa Hudgens (High School Musical). I watched it. And I have almost nothing to say about it, beyond: meh. That's why we're turning this conversation over to you. Did you watch Powerless? Did you like it? Are you thinking about watching it? If you fall into the "I've never even heard of this show" camp, you might want to check out the below trailer. Either way, let us know your thoughts in the comments! But I have to consider that it was a pilot so a lot of the stuff that didn't work (exposition, false drama about Tudyk's character leaving) hopefully won't existing moving forward. Haven't seen it yet, and the buzz is making me wonder if I should even bother. I wanted to like it, I used to watch Suburgatory just because Alan Tudyk was in it. That guy does a lot of voice work, but not that many live roles. I thought that the show was amusing, but shrill. Emily is very perky and needs to calm down. I'll watch a few more episodes. Anyone watch Santa Clarita Diet, yet? Sorry, Nathan Fillion, but once again my favorite character is someone else. Timothy Olyphant is hilarious in it. I didn't know that he was so funny. "Meh" is unfortunately accurate. I will watch a couple of more episodes because of Pudi and Tudyk, and because I like the concept. Maybe it will improve. But I'm not terribly optimistic. Telegraphed humor doesn't hit me. I just don't have that talent. Maybe that's why I don't watch sitcoms? This reminded me of "The Good Place", which I dropped after 3 eps. You just know that this series will be floating up in the air and we will never see a serious/emotional ep. And I like my Tudyk more Wash/Alpha-like. Felt pretty uninspired and the special effects were way off from what the Arrowverse does adding to the campy and cringy feel instead of making you laugh. I will continue watching for Tudyk and Pudi though, it might improve and even if it doesn't it's just a short season and it won't be renewed most likely. Josie & Mallena - No judging at all! I'm about done with the entire run of Santa Clarita and find it oddly hilarious. Timothy Olyphant is very funny and cute, and I think this is a perfect role for the always adorable Drew Barrymore. I also like the other folks that are making appearances. The show isn't really covering new ground, but is quite funny, IMHO.